For much of the last year now, the story of the high-end video card market has been the story of NVIDIA. In September of 2014 the company launched the GeForce GTX 980, the first and at the time most powerful member of their Maxwell 2 architecture, setting a new mark for both power efficiency and performance, securing their lead of high-end of the video card market. NVIDIA then followed that up in March with the launch of the GeForce GTX Titan X, NVIDIA’s true flagship Maxwell part, and a part that only served to further cement their lead. Based on the very powerful (and very large) GM200 GPU, GTX Titan X is currently untouched in performance. However priced at $1000, it is also currently untouched in price. In NVIDIA’s current lineup there is a rather sizable gap between the $550 GTX 980 and $1000 GTX Titan X, and perhaps more significantly GTX Titan X was the only GM200 part on the market. With NVIDIA launching their fully enabled flagship card first, it was only a matter of time until they released a cheaper card based on a cut-down version of the GM200 GPU in order to fill that pricing hole and to put salvaged GM200s to good use. Now just a bit over two months since the launch of the GTX Titan X, NVIDIA launching their second GM200 card, GeForce GTX 980 Ti. Based on the aforementioned cut-down version of GM200, GTX 980 Ti is the expected junior version of GTX Titan X, delivering GM200 at a cheaper price point. But calling GTX 980 Ti a cheaper GM200 may be selling it short; “cheaper” implies that GTX 980 Ti is a much lesser card. At $649, GTX 980 Ti is definitely cheaper, but the card that is launching today is not to be underestimated. GTX 980 Ti may be intended to be GTX Titan X’s junior, but with the excellent performance it delivers, GTX 980 Ti may as well be GTX Titan X itself. Taking a look at GTX 980 Ti from a specifications perspective, NVIDIA’s latest card is in a somewhat unusual place. Its direct predecessor, GTX 780 Ti, was a fully enabled GK110 card, differing from that generation’s Titan only in double precision compute capabilities and a trivial clockspeed difference. However with GM200 being a pure graphics chip – and hence GTX Titan X not pulling double-duty as a prosumer level compute card – NVIDIA has needed to turn to cutting down the chip itself in order to differentiate the products. In this sense the GTX 980 Ti is probably closer to being the GTX 780 of its generation, a very timely situation given the fact that GTX 780 launched almost exactly 2 years ago. 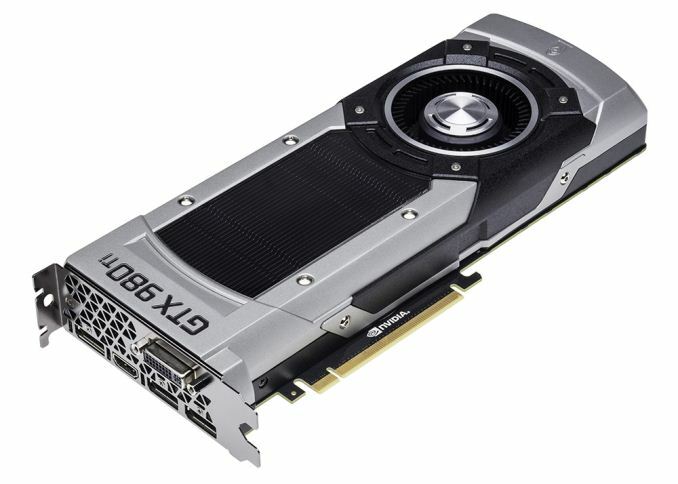 In any case, compared to GTX Titan X NVIDIA has made just two changes to create GTX 980 Ti. 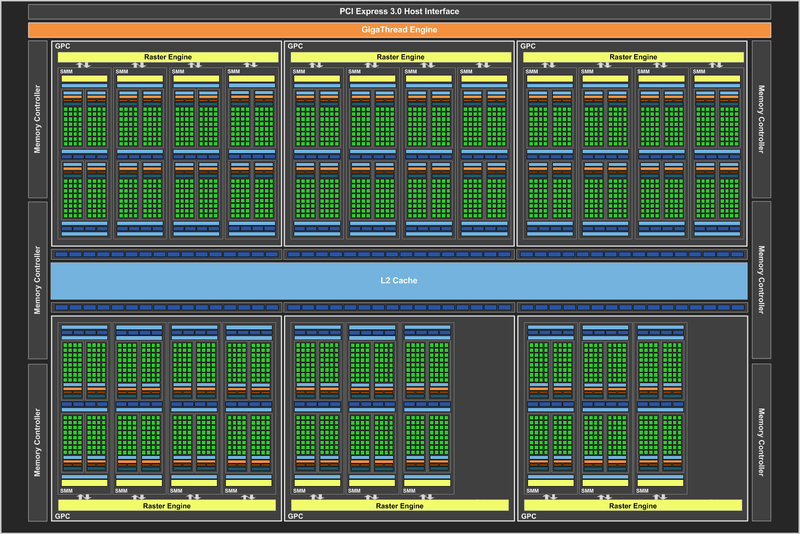 The first is that the company has disabled 2 of GM200’s 24 SMMs, bringing it down to 22 SMMs for a total of 2816 active CUDA cores. The second change was to dial back the amount of VRAM, from GTX Titan X’s 12GB to the 6GB we see on GTX 980 Ti. And that’s it. In every other aspect the GTX 980 Ti is identical to the GTX Titan X. Both are clocked at 1000MHz, with a boost clock of 1075MHz. Both feature their VRAM on a 384-bit memory bus with their respective VRAM modules clocked at 7GHz. Both are set for a 250W TDP, and are equipped with NVIDIA’s high end metal-shrouded cooler. And finally, GTX 980 Ti retains all 96 ROPs and 3MB of L2 cache, which means that in pixel-heavy situations like 4K it is as no disadvantage compared to GTX Titan X.
Consequently, looking at the specifications tells us that we should expect GTX 980 Ti to be 8% slower than GTX Titan X, a result of losing 2 SMMs. 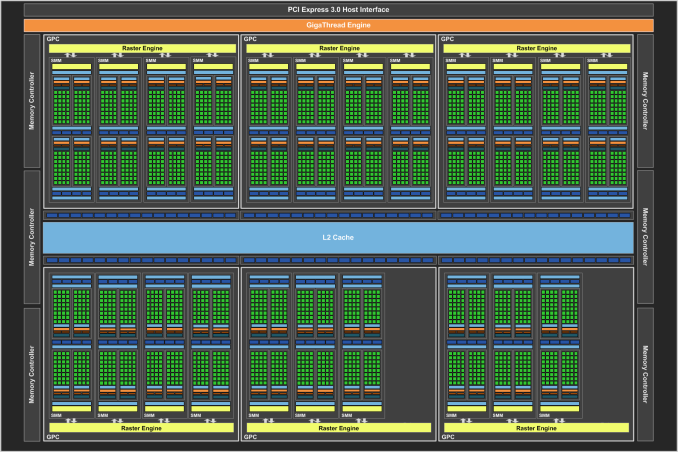 Coupled with the difference in VRAM between the two cards, this would put a decent gap between the two cards. However as we’ll see in our benchmarks, reality begs to differ. Thanks to the combination of a couple of factors GTX 980 Ti ends up coming much closer to GTX Titan X than what the specifications tell us to expect. In the end what we find is that it delivers 97% of GTX Titan X’s performance. This, in a nutshell, is what makes GTX 980 Ti a deceptive card, and is why it’s going to have such a large impact on the high-end market. Shifting gears, let’s talk about pricing, availability, and the competition. The GTX 980 Ti will be a hard launch, with cards going on sale on June 1st. Due to the fact that Computex is taking place this week in Taiwan and GTX 980 Ti is one of the products NVIDIA is launching at the show, NVIDIA has lifted the embargo on GTX 980 Ti at an atypical 6pm Eastern, which for Taiwan and Computex is June 1st, 6am local time. NVIDIA is launching the card globally on the 1st, so in a reversal of typical launches APAC buyers will get first dibs on the card, followed by European and North/South American buyers several hours later. Along with the GTX 980 Ti reference cards launching today, expect to see semi-custom cards launching very soon thereafter. Meanwhile for pricing, the GTX 980 Ti will be launching at $649. This is an increasingly persistent price point for NVIDIA that has fluctuated a bit over the last couple of years, with the GTX 780 launching at $649 as well, only for the GTX 780 Ti to launch at $699. The launch of GTX 980 Ti at $649 will be putting pressure on the rest of NVIDIA’s product stack from both above and below. In response to this launch NVIDIA is officially cutting the price of the GTX 980 from $549 to $499 in order to open up a bit more room between the cards and to keep GTX 980 Ti from making GTX 980 redundant. At the same time however GTX 980 Ti puts enormous pressure on GTX Titan X; GTX 980 Ti’s performance is close enough to GTX Titan X that the latter’s only practical advantage is its 12GB of VRAM, and that’s not a lot to justify the Titan’s $350 (54%) price premium. Not stopping there, in an unusual move for NVIDIA the GTX 980 Ti is getting a game bundle right off the bat. The card isn’t getting NVIDIA’s full Two Times The Adventure bundle that comes with the GTX 980, but it is getting a copy of the forthcoming Batman: Arkham Knight, another one of this year’s major GameWorks titles. The end result is that NVIDIA is being more aggressive than usual this time around, offering what amounts to a GTX Titan X and a game for $649. Of course the competition may have something to do with it. AMD is pretty much shouting from the rooftops that they are launching a new high-end video card this quarter, which at this point means the card is due by the end of June. While NVIDIA does have other financial incentives for releasing GTX 980 Ti now that GTX Titan X has been on the market for a couple of months, by all appearances this looks to be NVIDIA making the first move. We’ll have to see just what AMD delivers next month, but what is clear is that whatever they do, NVIDIA will not be making it easy by delivering flagship performance at $649. In the meantime AMD and their partners are also still selling the Radeon R9 295X2 for around $600, though it looks like this is part of an effort to sell off the remaining inventory of cards. AMD has no other cards in this price range, so the GTX 980 Ti is otherwise uncontested until AMD’s new card launches. Heh, I guess you don't normally shop in this price range or haven't been paying very close attention. $650 is getting back to Nvidia's typical flagship pricing (8800GTX, GTX 280), they dropped it to $500 for the 480/580 due to economic circumstances and the need to regain marketshare from AMD, but raised it back to $650-700 with the 780/780Ti. Nvidia is charging $650 for the first few weeks, but when AMD's card drops, you'll see the 980 Ti get discounted down to $500.